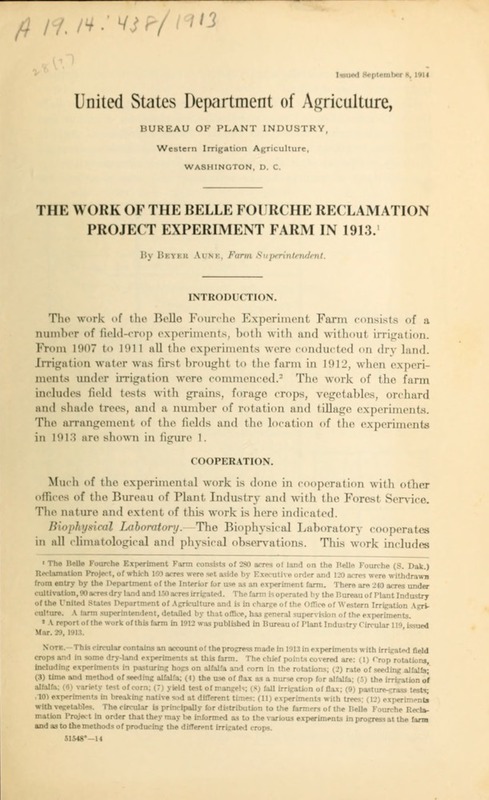 PROJECT EXPERIMENT FARM IN 1913. FromI 1907 tO 1911 all the eXplwrt' illllS WCre (lld lhed ,i drl :1, LAI. and shade trees, anlid a number of r)ittal i ain til ige expelwrillillts. in 1913 are shown in figure 1.
offices of the Bureau of Plant Ildustry and with the F"rest Service. The nature and extent of this work is here indicated. 1 *re. 1,, Il l.
T E FF I G. .
the location of the crop experiments in 1913.
is detailed to the farm to supervise this work. by the Office of Cereal Investigations has charge of these experiments. Approximately 20 acres of land are used. acres of land are used for this purpose. S"arm, 1908 to 19ll, in -uire-Continued. Year, etc. IanJm Ieh. Mar. \ pr. May. June. Jnly. Aur Sept Ot. 1. De Total. 1 9 .. ...... . ...... 5 A(, 7 7 -0 8 ...... . .: 36. 1911 ......... ..... 4 65 K 30 10 24 10 71 (i. ;8 11 i. 46. DAILY WIND VELOCITY (MILES PER I OlUR). 1908............. ..... ...... ...... ...... 19.6 12.1 12.9 9.0 13. 1913 ............. .... ...... ...... 10.5 12.4 1 4 4 9.0 13. .
0 0~ m ...11.9.14... .... ..... ...... .
. ... ...... 1.7 1 2. 2. .
1910 .... ....... 1 1.7 3. 2.9 2.9 2. 1911 ............ 1.2 I2. 3A 3. 4.5 2 s 2 4) -. 13 2 1 . .
1912 ........ .S 2.1 1.8 3.0 2.9 1 3 0 2 1.5 .. ... ...... .. .
1911.. ...... 20 22 39 42 5S 73 71 15 59 43 25 20 . 1912...12 25 19 47 55 (41 70 )I8 52 45 38 2 ..
190S ... ... .... .. ...... 89 79 90 100 101 103 S2 75 49 . 19()9............. 50 51 65 73 84 95 100 105 96h S4 73 49 ..
1912 ............. 44 49 70 78 S4 101 94 95 94 Lt 70 57 . Las1 spring frost ............... May 21 May 18 May 21 May 12 May 4 May 6 ..
First fAll frost.... Sept. 22 Sept. 24 Sept. 26 Oct. 4 Sept. 25 Sept. 24 . (iO + 11( )1 D I ION NS. figures ieing oluaimtel froi lth, l'nittle Stats lein'litalion Strvite. 11ALI1 1 !II . (crest;* Vr i, s t d r/ r u it f.x ..,,m AK 1 t., If !,"1, /'s MrIN, tqppy l i l ;. usr 14E 7 . T I ( :) t :1 ) S .
igon .. 17 d .. .d..1 I .1 x .
Belle Fourche Erperiment Farm in L913. two different cropping systems are being tested. the Ilteness of this planting probably reduced the yield considerably. wvith 51.9 Ibm els per acre in 1912.
was obtained oni alfalfa nld, which prodluceill 176 bu ishll. lr acre. obtained whre corn followed Imrlev. the average of all the plot- was 3.4t9 tons. PAST RING; ALFALFA WITH HOCS. days. During tihe two periods, 74 days, the hiogs gained 171 pounds. acre, or $11 ail acre. land to be pastured if the alfalfa is to be used to the best advantage. price of alfalfa hay onl the project was about $5 at ton. The corn plat, lit rotation 65 is to b~e harvested by hogs each year. i, zjs umcd thai tho h(.,.j' d plat l."IMlu,11, al, ,m,,r \ Ad,. is [ p .. is il ht. 10 11/ f il li'tIri nt )lu i l 1 I, tI'1.. 1 /8hih n'..
RIATE oF SE:I:I1 1 I. ,. T A IIIe; I\+ .160 .!> sway -of' ;: .1 o+r,. *, r .+ ,+.... *, t .+,,i ,! the differentt rates can be determined. TIME AND METHOD OF SEEDING ALFALFA. nurse crop of wheat to determine whether that method is desirable. obtained in this experiment in 1913 are given in Table V.
Method and t ime of seeding, her Alfalfa. Tons. Tons. Tons. Tons. Bushels. phlti n lilg4 H e e ti 1 1 4' alh.t lit h's l iL Ito *\ ol),rit!M It d l, h W .
THilE t. 1 .1 SR N 1 11 tM t US CIro 1- int.1 l.
thi aIs e ,I t I alf:lfa a litne, l I Ilhe r e i f 1 I l,"ifils I Her :1n . litIth. %I lf)N OF Al1ALFl. little effect was produced by irrigation in the fall and early spring. irrigation or early-spring irrigation would have a beneficial effect. Whether or not this will be the case remains to be determined. in Table VI, being calculated on a basis of 12 per cent moisture. FAl.I IRI llTION ( IF FLAX. buslihels per acre antl te oth 'er lt pronuIneed iS.i Ihli.hel lur acre. will be contionel in 191+I. were planted at the rates specified in poumls per acre. W vheat-grass, 1) potuils : ald pereftillial r -LfT-;s. 2 ilsn. pounds of white clover and 2 pounds of alsike clover seed were added. mixtture C as in mixture B and 2 pounds of alfalfa seed were added. and to find out which of the mixtures gives the best results. inclusive, in 1911 and 1912, and one plut was plowed in April, 1913.
free from weeds by shallow cultivation with a disk and a harrow. The yiehls obtained in 1913 are given in Table VII. 1914 on pits I-oken during the aon If 1 1: . break purposes have been carried oi in cotleratin with t lhe "orest. the Scotch pine killelt out entirel. was extremely dry, Ibut all the trees whiih tarted growth in tih. so the season's growth did not ripen up well to go into the winter. cold on the western plains makes them valuable. because of the poor condition of the trees when they were received. back very badly, 1)ut they made a vigorous growth in 1913.
i)lanted cottonwoods. The work with trees under irrigation has not ..
as to which species should be plantedl by farmers oil the project. of 20 per cent -tre:lth ,as iseild, the -hot-. Iivle placed 21 feet lpurt. seeded t' Si) tv- )a v ts. check pints i hldel 25.0 and 21.1 I)ushl iwTr nce, rl-jectively. that ill the fr -lamI crops sulfl'red frnt dr nught. appeared in Alugust. 1 ):1, is shlw i, in Iiclare I.
named is the earlier niaturling. PIu pkin. -Small Sugar, Jap)aiese Pie, and Connecticut Field. The last named is rather late in maturing. S.iu (t corn. Peep o' Day, Black Mexican, and Disco Evergreen. Wat rmo l,,n. -Sweet Heart, Cole's Early, and Fordhook Early. Muhiskm(lon.-Emerald Gem, Rocky Ford, and Disco Gem. ('nrUmbrt. .Arlington White Spine and Improved Long Green. Tomato. Aclme, Ponderosa, and Earliana. Wax, anid Seibert's Pole Lima. Turnip.-Extra Early Milan and Purple Top Strap Leaf. Pea.- -Stratagem and Thomas Laxton. different kinds of vegetables have been successfully grown here. Lettuce. -Grand Rapids, May King, a(nd Prize Head. will be continued in 1914, and several new experiments will be started.